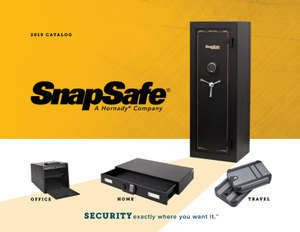 The SnapSafe® Lock Box provides secure storage for handguns and other valuables at home, on a nightstand, in the car, or when traveling. All SnapSafe Lock Boxes come with a heavy duty 1500 lb. rated steel cable that secures to any stationary object including a vehicle seat or heavy piece of furniture. The patented, space-saving receiver of the cable allows maximum storage space inside the box. The Lock Box also provides security for concealed carry permit holders. Easy to operate steel key lock mechanism. Keyed option includes two keys that are keyed alike (2-pack option includes four keys). 1500 lb. rated 4 ft. steel security cable† (2-pack option includes two cables). Thick 16 gauge steel housing is durable and pry resistant. Meets TSA airline guidelines for firearms storage*. Approved by the California Department of Justice for firearms storage*. *IMPORTANT: Check TSA regulations and airline policies before traveling with any portable safe. Check dimensions of your firearm against safe's internal dimensions to ensure fit. Do not store loaded firearms in any safe or lock box. Follow local laws for firearm storage.